Maintain lists of FAQs in an easy-to-use admin screen, where you can group them together by "Type", move them up/down the list, and easily create/edit them. 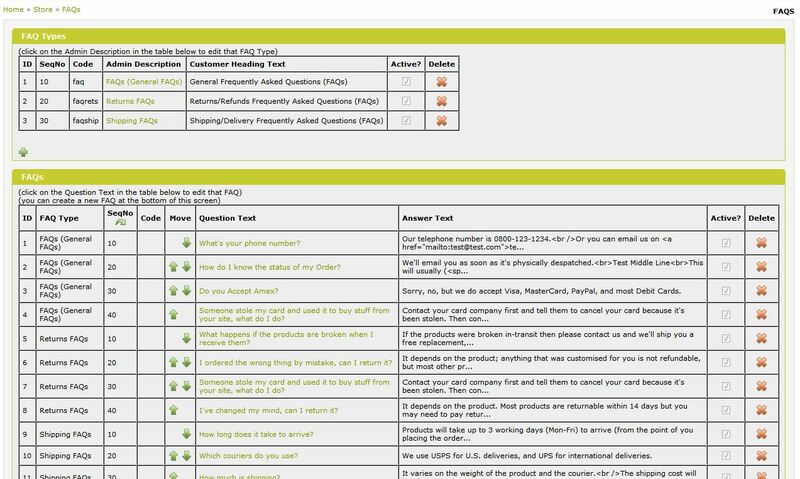 This module contains the admin aspect (ie maintaining the data via a dedicated screen), as well as the customer side (ie viewing the FAQs on the main site). 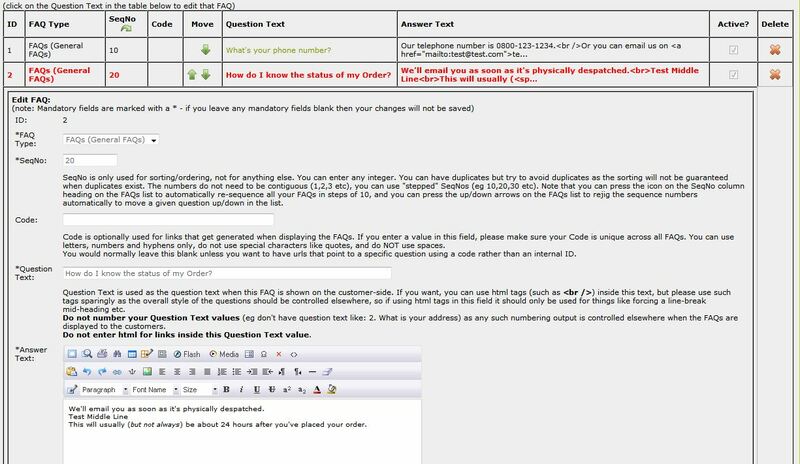 For the customer side (ie viewing the FAQs), you can have pages that show all FAQ Types in one shot, or you can have pages dedicated to a specific FAQ Type, or you can have both. For example, you can have a "faqs.asp" screen which shows FAQs about returns, shipping, and contact, and you can also have separate screens like returns-faqs.asp, shipping-faqs.asp, and contact-faqs.asp which show FAQs dedicated to that type. 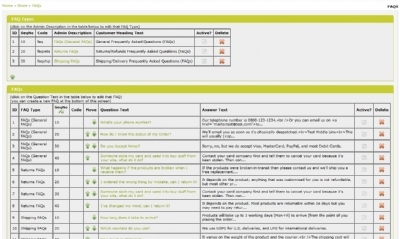 For each display on the customer-side, you can also choose between "Linked" (ie repeating) FAQ format, or "List" format. "Linked" format is when you have a format like Q1/Q2/Q3, then Q1+A1/Q2+A2/Q3+A3, ie a question summary block at the top where each question is linked to the detailed answer in a bottom block (and where the question on the bottom block is linked back to the corresponding question summary on the top block again). 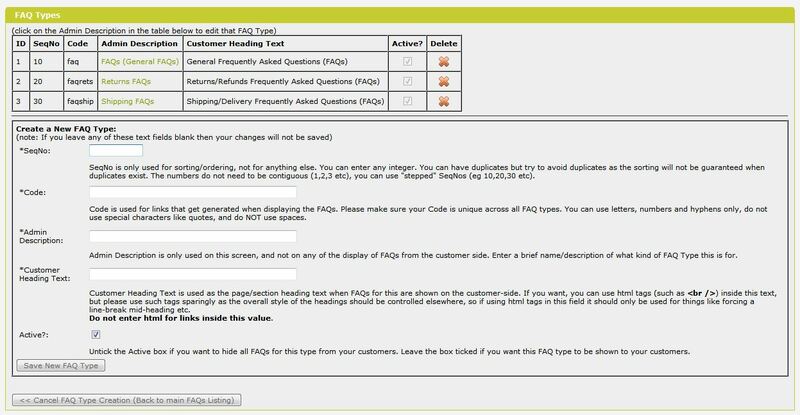 All this linking/display logic is done for you - you just type in your raw question/answer data into the maintenance screen and the display module does the work for you. "List" format is when you have a format like Q1+A1/Q2+A2/Q3+A3, ie you have all the questions/answers shown in pairs once question after another, with no top summary block. 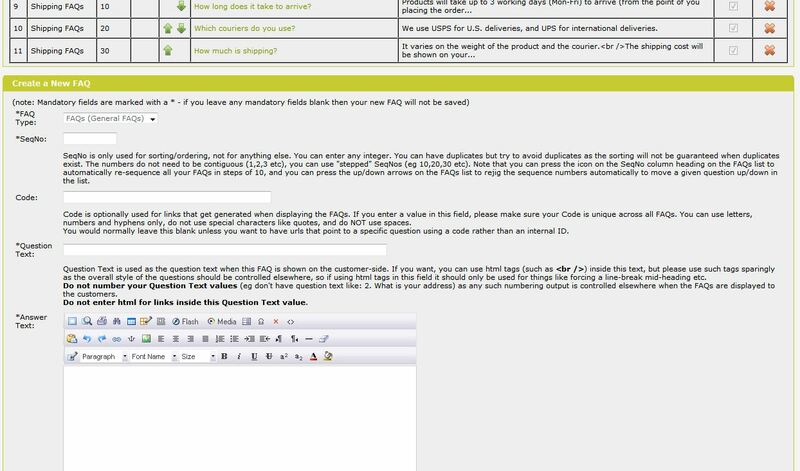 If you want to tweak the format/logic of the display of the FAQs on the customer side (eg to add numbering) then that's very easily done. We've split-out the relevant functions into separate files, fully commented, so it's easy to do things like add extra spacing, add numbering, or generally alter the styles/format etc. The module comes with detailed usage notes which explain exactly which files do which bits regarding the html output, and how to setup the physical files on the customer side with the relevant FAQ display calls. It automatically sets up sample data as part of the installation, so you can see how it works and try different formats on your site without having to create data first. The FAQs maintenance screen process/displays all the html tags (if you've entered any) from your questions/answers in a relevant way, so that the screen doesn't get garbled and so that your html doesn't get corrupted during the save process. 02 27-NOV-2011 Changed to use the generic BYZ cursor opening/closing functions to help avoid cursors getting blanked-out with 8k/memo (text/ntext) bugs and to help minimise memory usage. Upgraded BYZ038 (from V12 to V15). Please Note: If upgrading from a previous version of BYZ169, you must make sure you are using V14 or above of BYZ038 before upgrading to BYZ169 V02 or above. 03 19-NOV-2012 Added meta/title tag setups to samples. Added a new faq-types list screen sample (customer-side). Changed BYZ_FAQ_QUERY_QAS function to allow wildcards for the FAQ Type code argument. Changed to use more BYZ library functions/files. Upgraded BYZ038 (from V15 to V20). Upgraded BYZ036 (from V10 to V15). Upgraded BYZ025 (from V06 to V08). Please Note: If upgrading from a previous version of BYZ169, you must make sure you are using V20 or above of BYZ038 before upgrading to BYZ169 V03 or above, and you must also be using V08 or above of BYZ025. For list of effected files, see the version history readme file that comes with the zip.